The poet Assaf begins Psalm 81 by summoning us to join in joyous praise of the Almighty, and specifies numerous instruments – as well as the Shofar, to be used on Rosh Hashanah – with which we are to conduct this celebration. From verse 7, however, Assaf is no longer the speaker, as he instead cites God's admonition to <?xml:namespace prefix = st1 ns = "urn:schemas-microsoft-com:office:smarttags" />Israel to obey His word. God recalls the Exodus from Egypt, how Bene Yisrael cried out for help and He granted them deliverance. Had the nation obeyed His commands and remained faithful to their covenant with the Almighty, they would have continued to enjoy peace and success, and all their enemies would have been subdued. Sadly, however, they acted disobediently and thus suffered anguish and defeat (verses 12-13). God here invites the Jewish people to "open their mouths" so He could "fill it" to capacity, granting them all the blessings in the world (verse 11). If we are faithful to Him and obey His commands, then we could enjoy the same level of kindness He bestowed upon our ancestors, and we would be lacking of nothing. 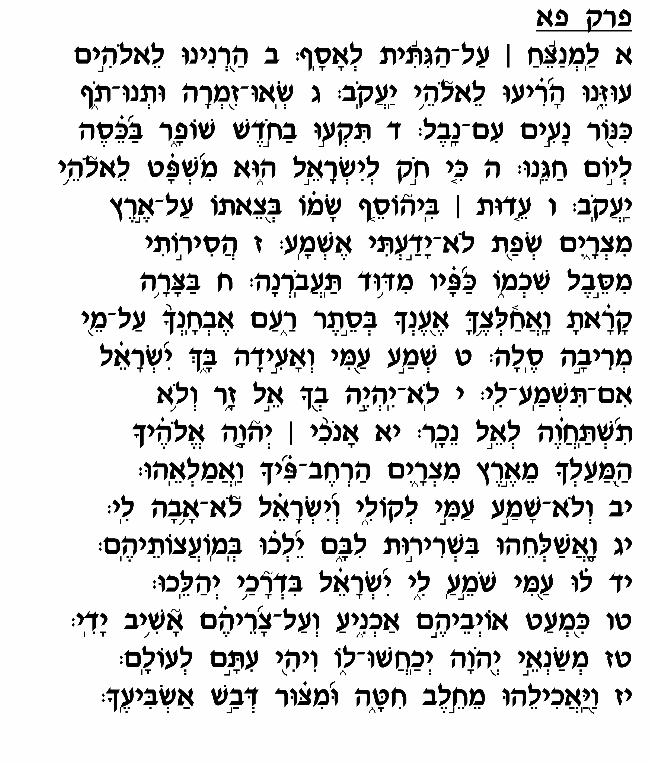 This chapter is read each week as the "Shir Shel Yom" (daily Psalm) for Thursday, a practice that was followed already in the Bet Ha'mikdash. The Gemara (Rosh Hashanah 31a) explains the relevance between this chapter and Thursday as based upon the second verse of this Psalm, which calls upon us to give praise to God. On the fifth day of creation, the Gemara comments, God created the birds and fish (Bereshit 1:21) which bring a person to give praise to God. The sight of so many different species of birds and fish covering the entire expanse of the earth, from the highest levels of the atmosphere to the deepest recesses of the sea, leads a person to appreciate the vastness of the world and the greatness of its Creator. This appreciation should inspire a feeling of love for the Almighty and a desire to commit oneself wholeheartedly to His commands, and thereby be deserving of the unlimited blessings He has promised to those who are obedient and faithful.